Welcome back to gift week - the week that we give you tons or inexpensive and easy gift ideas that you can DIY! Today’s DIYs are candles! Do you know one person who doesn’t love candles?! This DIY is also awesome because you can be super eco and upcycle old candles into new ones for the holiday season! Let’s get started! You will need some plain wax, either from already formed candles or from wax bricks from the craft store. Use something sharp to break apart the candles so they’re easier to melt. We’re using dollar store basic candles, we found this to be a much cheaper option than candle wax from the craft store. Melt down your wax by either putting an existing glass candle in the oven or using a double boiler technique on your stove. If you don’t know how to create a double boiler, place a measuring cup inside of a pot with water and bring the water to a boil. Make sure this is a measuring cup you don’t cook with because the wax will make it pretty messy. While that is melting, add your wick to the bottom of your mug using super glue. We’re using a wooden wick because they sound like a little campfire when they’re burning. Once your wax is completely melted, add your candle scent into the mixture. For this candle, we’re using a combination of lavender and vanilla. Since the amount of scent required can differ based on the strength of the oil, follow the instructions listed on your scent packaging. A basic general rule though is of 1oz scent for 1oz wax. Mix it all together and then pour your wax into your container and leave it to dry completely. Be careful because this will be very hot. 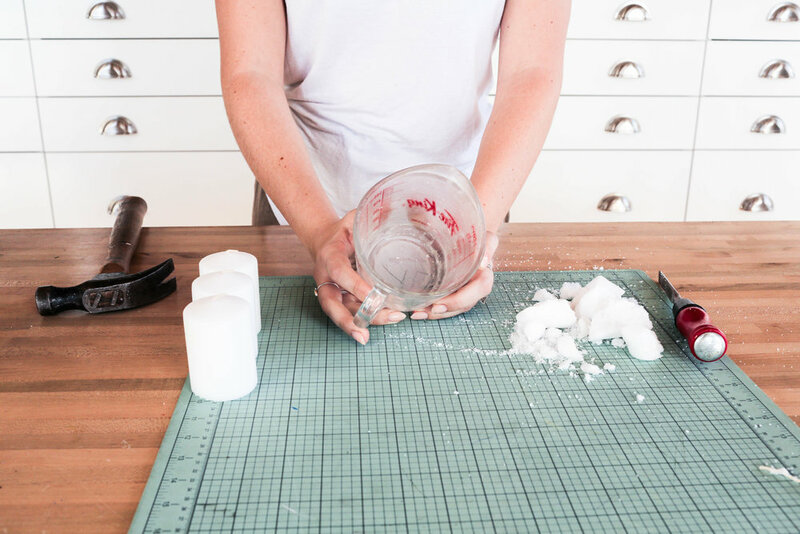 Once its cooled, you’ll have your completed DIY candle! We love the look of this copper mug with the wooden wick. Using the same process as the copper candle, melt your wax in a double boiler or in the oven. For this candle we’re going to be adding sprigs of a cedar tree for a festive feel. To avoid burning the greenery, we are using two glass containers. The first is smaller and will contain the 3 wicks and most of the wax, and the outside will have the pine sprigs and berries spread across the side and some more wax. Starting with the smaller container, add your three wicks to the bottom using super glue. We’re using regular candle wicks this time because they’re slimmer and we wanted to do 3. Using two wooden skewers, tie the wicks up so that they don’t fall over while they wax is hardening. Once the wax is melted add in your scent. This time we’re using a mix of amber woods and cinnamon to make a woodsy holiday scent. Pour the wax into the smaller jar first and then let this cool completely. While that’s drying i’m going to start adding the greenery to the larger container. Take your melted wax and using a paint brush, brush over the branch onto the glass. You’ll want to brush slightly over the edge to keep it in place. This is similar to the way you might modpodge something. Once you’re happy with your design around the edge, place the mini candle into the larger one. You’ll have to re-tie your wicks to the skewers, but this time to the taller candle. We’re adding some red berries around the edge as well and then filling up the entire rest of the candle with wax. Once that’s completely hardened, cut the wicks to the right length and clean off any dried wax around the top edge! And that’s it! If you liked this post, check out the video below + we’ll see you next time!